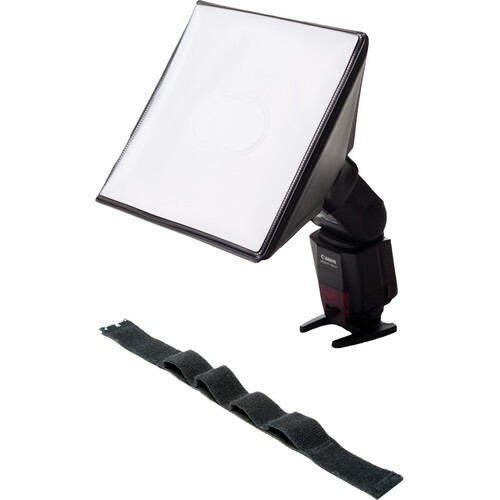 Modify your on-camera flash to be a large, soft light source with the black SoftBox III with UltraStrap from LumiQuest. The bundle features the SoftBox III which is center-weighted and measures about 20 times larger than the size of the flash head. This allows it to create soft, diffuse light from the normally harsh light of the flash unit. It comes with the UltraStrap, which has hook-and-loop fasteners for attachment to an on-camera flash unit. Box Dimensions (LxWxH) 12.6 x 8.9 x 1.1"
SoftBox III with UltraStrap (Black) is rated 4.5 out of 5 by 120. Rated 4 out of 5 by DiscoDan from Nice product I'm using the Promax on a Canon 580EX II flash and so far I really like the effect I can get when using it. It was easy to setup and put on my flash but...one thing I didn't like right out of the box is that unless you buy a wrap-around Velcro strap, you would need to use the Velcro stick-ons that come with the Promax. Personally I didn't like the idea of permantly sticking these things on my flash. Fortunately I had an elastic strap I use backpacking that worked just fine in securely wrapping around the Promax and the flash thus attaching the Promax to the flash. Overall the construction of the item seems to be good and I thought the price was fair for what I received. Rated 4 out of 5 by Vincent from Versatile and Effective I use SBIII mounted on my SB-600 often as a key light for tight portraits or to soften an accent or rim light. No matter what the role, the SBIII has proven to be a very useful and very versatile addition to the kit. I've even found that it works quite well for close up lighting of objects for still life or product photography. The fact that it folds flat and can attach via a hook and loop fastener speed strap to nearly any flash head ensures it will have a place in my bag for a long time to come. My only real down side is that if you don't make sure to get it on the flash head securely when you first attach it, it can drift a little bit. Rated 5 out of 5 by Signal 7 from A must for strobist It is installed to your strobe by 4 pieces of velcro or an optional velcro strap, sold separately. I used the adhesive velcro. You can put it on in about 30 seconds. It is kind of flimsy at first but once you apply all the sides, it's plenty sturdy. I did test shots immediately after it arrived. It did a really good job of spreading the light very smoothly. I am very pleased with the results and am purchasing another one as well. I would suggest if you are into strobist photography, this is a fantastic defuser. I would suggest the optional velcro strap to put around all the mounty tabs for outdoors. Not a must but a good addition. Rated 5 out of 5 by Rosegold Creative from Tiny & Awesome Stick some velcro on your speedlite and pull this thing out of your bag, and you can really up your image quality. It weighs nothing and will definitely save the day once in a while. The best part is that it folds flat and is easy to keep in the pocket or laptop section of a photo bag. I've used it outdoors as a fill flash and on a stand as a backlight with a pair of studio strobes, and it's been fantastic. Time will tell how durable it is, but it seems well made enough (in the USA!) and will be cheap to replace if I manage to break it. Rated 4 out of 5 by Anonymous from I like it. I use a SB600 hand-held up and to one side for people-pictures and this softbox really does a nice job. I hope to use it soon on a stand, but for the time being, it's spur of the moment pictures (people at a reception or party and children) and I like the quality of the light I'm getting. It's not for the group shot. Best used for individual shots. Rated 5 out of 5 by Anonymous from Softens light when held close to subject I have really enjoy using this softbox on the end of a off-camera flash cord. In order to get good results, you need to hold it pretty close to the subject. In some cases 12 inches or less, but the results are quite stunning. Eye color pops out of the image. When held closeup in full sun, the effect is modern and edgy. One problem is that it is awkward and conspicuous. You really can't sneak up on anyone with this diffuser. Furthermore, you won't have the range to shoot from long distance. This really is mostly for closeup portrait photography and headshots. Rated 2 out of 5 by Nelson from Works pretty well, not well made One of the best tiny softbox accessories currently available as far as convenience and light quality...but they need to improve the build quality. After a short period of only light use, one of the velcro tabs tore loose on mine, and the inner white vinyl layer is separated from the outer black layer due to weak welds along the sides. So now I can only secure it on 3 sides of the flash. If I add a rubber band, it's fine - just a nuisance. They need to re-engineer the velcro attachment points because they are not durable enough to stand up to much pulling - and they are the main stress points. And no, I was not rough with it, if anything I babied the thing because I was worried about the durability. Turns out I was right. Hopefully they'll get it ironed out with the Promax IV. Rated 5 out of 5 by D from Excellent I use the Promax Softbox III for softening the light output on my SB800s and SB900. I really like that in addition to softening the light output, it saves battery life by directing the light in one direction. It does cover the AF Assist on the flash units (which is pretty much only an issue in dimly lit situations), but that is easily remedied by using an SC29, or SU800. I was worried before buying that it would be flimsy and fall off easily, but I was pleasantly surprised by its durability. If this softbox interferes with the auto focus assist and the auto exposure, what is the best way to use it? Can my SB 600 flash still be used wirelessly as a slave with my Nikon d 90 in the commander mode set to TTL metering? Or,do I need to use manual metering and manual focus when using this softbox? I also have a SC-28A TTL cord that will work, but I'm mostly inquiring about the wireless capabilities with this softbox on my external flash.